Home Applications “Evil Quiz” for your iPhone-Play it if you dare! 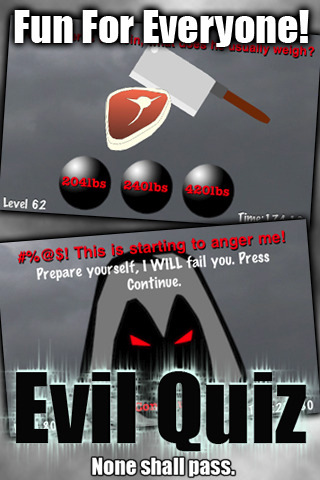 “Evil Quiz” for your iPhone-Play it if you dare! Announcing the release of new app called “Evil Quiz" for iPhone, iPad and iPod touch users. "Evil Quiz" appeared on the iTunes app store this week and had already rose to the top 100 app in the entertainment category and the sales are still rising. The developers of the app are surprised with such results so the future release of updated version with additional levels has already been scheduled. 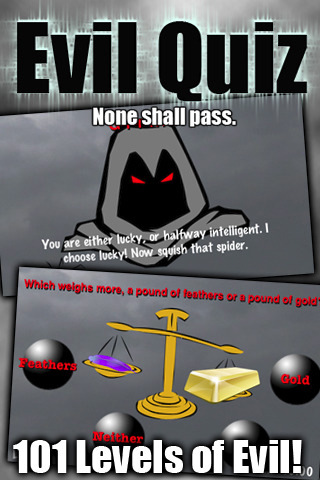 “Evil Quiz" is kind of test, it consists of questions and riddles and 101 levels. All you have to do is to pass this devilish test but it is too hard to handle. No one is able to pass it over 100 levels. These unique questions make you fail over and over easily. But you can try to play if you dare! Maybe you are the one that can do what no one else can! But watch out, don’t throw your iPhone suddenly at the closest brick wall, as the company won’t be responsible for your loss. 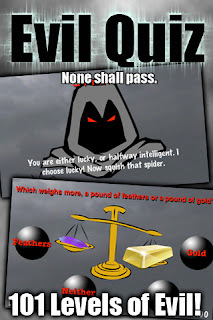 Evil Quiz 1.1 is only $0.99 USD and available worldwide exclusively through the App Store in the Entertainment category.